On behalf of all the citizens of Konu Town, I heartily congratulate you that you won the Nobel Prize for peace. We have had our children’s cross-cultural exchange home-stay learning program at your hometown for 12 years since you visited to Konu town in 1990 from Shoganji temple bell bond. The children who met you and citizens of Konu town sympathize and respect your mission to “build hope”, “wage peace”, “protect human rights”, and “fight disease”. I will try to manage our town according to your philosophy. Konu town citizens are not only so delighted at the news but also proud of your prize, and we consider that it is all because of your worldwide activities for peace and poverty for a long time. Best of luck with your activities for the peace of the world. Congratulations on your wining Nobel prize for Peace 2002. 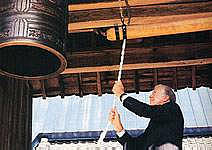 We have been connecting with you from Shoganji temple bell. Shoganji temple, Mayor of Konu town Mr. Morioka and all the citizens of Konu town, we would like you to extend our warmest congratulations to you. I am the acting him. Shodo Yoshii, assistant 19th President of Shoganji temple.